This fruit can reach the size of a basketball and is oval with a thorny, green to brownish skin. The interior sections contain thick, yellow, soft, sweet flesh, but it has a really foul smell. Only available in frozen or canned form in the U.S. Enjoy pulp alone or deep fry, use in cake, candy, ice cream, or drink recipes. But beware of the awful odor! 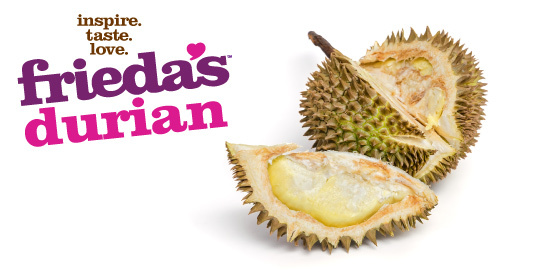 Durian is low in cholesterol and sodium. Keep frozen or defrost and refrigerate up to 3 days. If fresh, keep at room temperature up to 5 days.